Only ground transport Private air-conditioned van, felucca, Nile cruise boat, plane, walking. The overnight train is a modern air-conditioned sleeper train with twin-share bunk-bed compartments. There is no shower in the cabin, but each cabin does have a sink. The shared toilet is located at the end of each carriage. A basic airline-style tray meal for dinner and breakfast is included. Attendants can serve drinks in your compartment at extra cost and there is a bar car for socialising. Our Nile cruise boat is modern with many of the amenities of our comfortable hotels. Cabins are twin/double with air-conditioning and private bathrooms. Facilities on board include a large single-sitting restaurant, lounge with bar and sun deck with small pool. Often our cruise boats are referred to as "floating hotels" as the actual sailing distance covered is not great and Egyptian law requires that all boats dock overnight. Local Flights All local flights are included in the cost of your tour unless otherwise noted. It is important that we have your passport information at the time of booking in order to process these tickets. Internal flight tickets are issued locally and will be given to you prior to the flight departure. 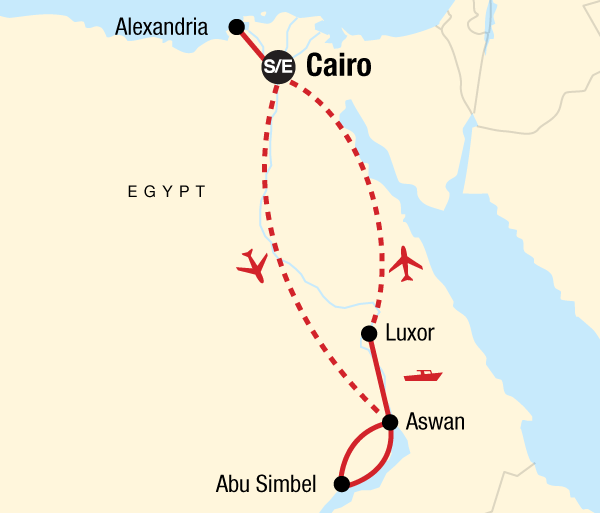 Domestic carriers for internal flights in Egypt will be Egypt Air or Nile Air. Flight information will not be available until a couple of days prior to the tour departure. The domestic flight maximum weight allowance is 20 kg. On this trip we will stay in comfortable hotels. Rooms will be on a twin-share basis unless you have booked our My Own Room service. You can expect the rooms to have air-conditioning, private bathrooms and breakfast will be included daily. Some hotels may also have swimming pools and/or other recreational facilities. Our Nile cruise boat is modern with many of the amenities of our comfortable hotels. Cabins are twin/double with central air-conditioning, private bathrooms, with large panoramic windows offering great views of the Nile. Facilities on board include a large single-sitting restaurant, lounge with bar, sun deck with small pool and Jacuzzi, a billiards bar, and internet cafe. Often our cruise boats are referred to as "floating hotels" as the actual sailing distance covered is not great and Egyptian law requires that all boats dock overnight. 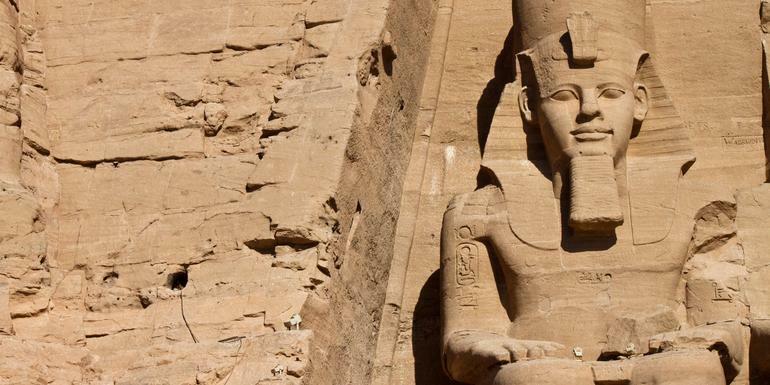 Guides Certified Egyptologist as Chief Experience Officer (CEO) throughout. 1. EXCURSIONS If you arrive a day or two early in Cairo and wish to do some excursions, we recommend that you wait until you get to the joining hotel and contact our local staff for more information on available tours and excursions. Tourists are frequently over-charged for excursions bought from vendors on the street or at the airport. 2. RAMADAN According to the lunar cycle, Ramadan will fall between May 5th and June 4th, 2019. Please note that Ramadan is a month of fasting observed by Muslims throughout the world, during which time the followers of Islam should not eat or drink between sunrise and sunset. There may be some limitations to services and disruptions to schedules during Ramadan, but generally our tours still operate effectively during this period and food is available to non-Muslims throughout the day. It is very important to display increased cultural sensitivity during Ramadan. Please wear loose fitting clothes, that cover knees and shoulders, and try to avoid eating, drinking or smoking in public out of respect for those who can't at that time. 3. EXTRAS Looking to add to your experience? Check out our Extra! Specially designed for travellers with unique interests, theme packs are optional add-ons to your G adventures trip that make your adventure more you-centric. Extras must be booked prior to departure, please see details in our optional activities field and ask you sales CEO. 4. ASSUMPTION OF RISK Please note, an Assumption of Risk is to be signed at the time of confirming your tour. Eating is a big part of traveling. Travelling with G Adventures you experience the vast array of wonderful food that is available out in the world. Generally meals are not included in the trip price when there is a choice of eating options, to give you the maximum flexibility in deciding where, what and with whom to eat. It also gives you more budgeting flexibility, though generally food is cheap. Our groups tend to eat together to enable you to taste a larger variety of dishes and enjoy each other's company. There is no obligation to do this though. Your CEO will be able to suggest favourite restaurants during your trip. Please refer to the itinerary for information on included meals.